The group was led by Project Assistant Professor Hiroki Kashimura (Kobe University, Graduate School of Science) and these findings were published on January 9 in Nature Communications. Venus is often called Earth’s twin because of their similar size and gravity, but the climate on Venus is very different. Venus rotates in the opposite direction to Earth, and a lot more slowly (about one rotation for 243 Earth days). Meanwhile, about 60 km above Venus’ surface a speedy east wind circles the planet in about 4 Earth days (at 360 km/h), a phenomenon known as atmospheric superrotation. The sky of Venus is fully covered by thick clouds of sulfuric acid that are located at a height of 45-70 km, making it hard to observe the planet’s surface from Earth-based telescopes and orbiters circling Venus. Surface temperatures reach a scorching 460 degrees Celsius, a harsh environment for any observations by entry probes. 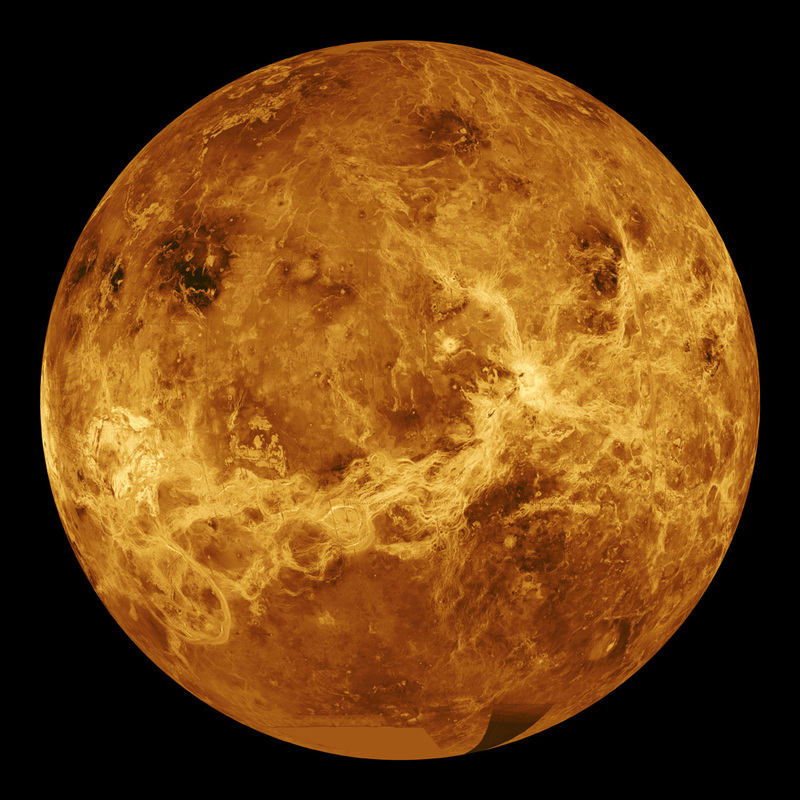 Due to these conditions, there are still many unknowns regarding Venus’ atmospheric phenomena. To solve the puzzle of Venus’ atmosphere, the Japanese spacecraft Akatsuki began its orbit of Venus in December 2015. One of the observational instruments of Akatsuki is an infrared camera “IR2” that measures wavelengths of 2 μm (0.002 mm). This camera can capture detailed cloud morphology of the lower cloud levels, about 50 km from the surface. Optical and ultraviolet rays are blocked by the upper cloud layers, but thanks to infrared technology, dynamic structures of the lower clouds are gradually being revealed. Before the Akatsuki mission began, the research team developed a program called AFES-Venus for calculating simulations of Venus’ atmosphere. On Earth, atmospheric phenomena on every scale are researched and predicted using numerical simulations, from the daily weather forecast and typhoon reports to anticipated climate change arising from global warming. For Venus, the difficulty of observation makes numerical simulations even more important, but this same issue also makes it hard to confirm the accuracy of the simulations. 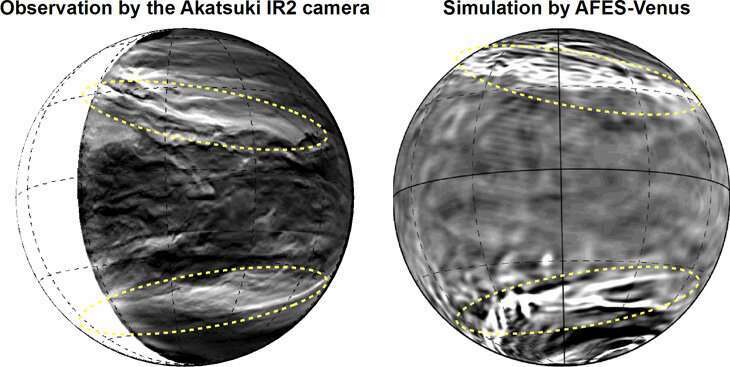 This study compared detailed observational data of the lower cloud levels of Venus taken by Akatsuki’s IR2 camera with the high-resolution simulations from the AFES-Venus program. The left part of Figure 1 shows the lower cloud levels of Venus captured by the IR2 camera. Note the almost symmetrical giant streaks across the northern and southern hemispheres. Each streak is hundreds of kilometers wide and stretches diagonally almost 10,000 kilometers across. This pattern was revealed for the first time by the IR2 camera, and the team have named it a planetary-scale streak structure. This scale of streak structure has never been observed on Earth, and could be a phenomenon unique to Venus. Using the AFES-Venus high-resolution simulations, the team reconstructed the pattern (Figure 1 right-hand side). The similarity between this structure and the camera observations prove the accuracy of the AFES-Venus simulations. Next, through detailed analyses of the AFES-Venus simulation results, the team revealed the origin of this giant streak structure. The key to this structure is a phenomenon closely connected to Earth’s everyday weather: polar jet streams.